I hope everyone is not tired of seeing these pieces. But everyone wanted to see them framed and I got them back from the framer and I’m really happy with them. 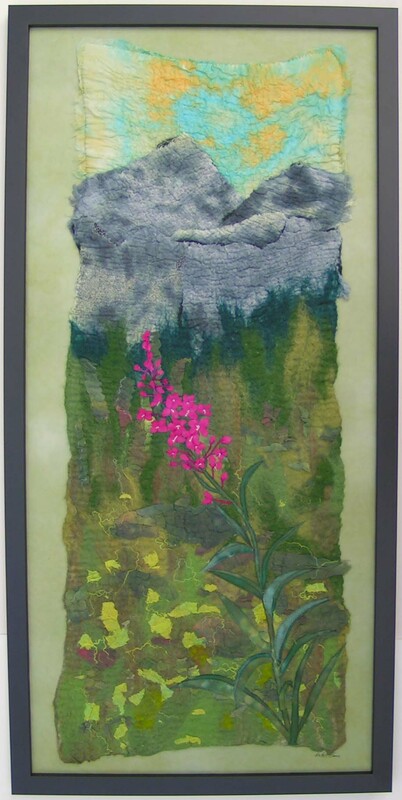 They will be in an exhibition in September at The Purple Pomegranate in Whitefish, Montana, USA. The name of the exhibition is Directions and features four other artists. If you’re in the area, the opening will be September 6th from 6-9 pm in conjunction with Whitefish Gallery Nights. 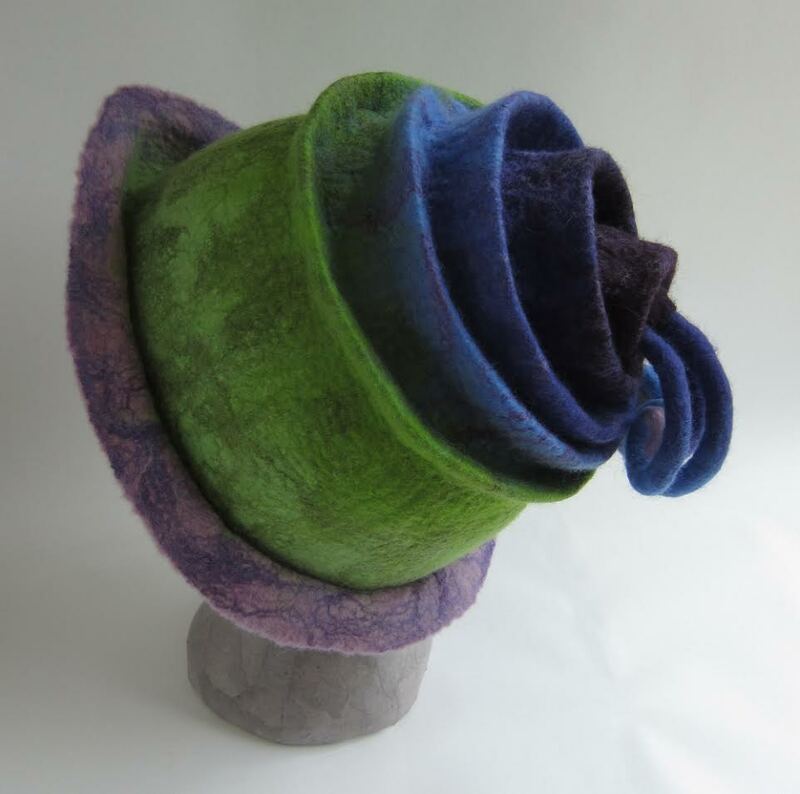 Also, I wanted to remind everyone that Teri Berry’s Felted Concertina Hat online class is open for registration. You can register here. You can learn to make great hats like this one! 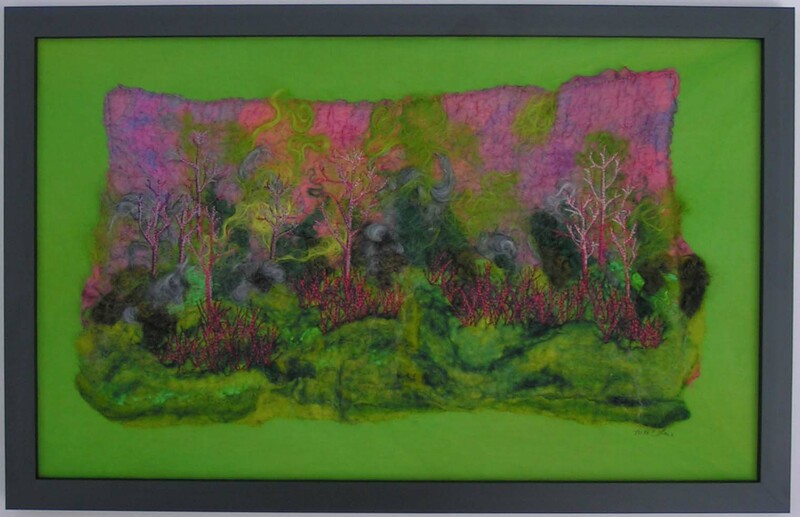 This entry was posted in Finishing/Framing and tagged Fiber Art Exhibition, nuno felted landscape. Bookmark the permalink. They look wonderful in their new (lovely colour) frames – I don’t think you’ll have any trouble selling those! Thanks Lyn! Just the simple framing really makes them pop. I can see why you are happy with them Ruth, they look fab. 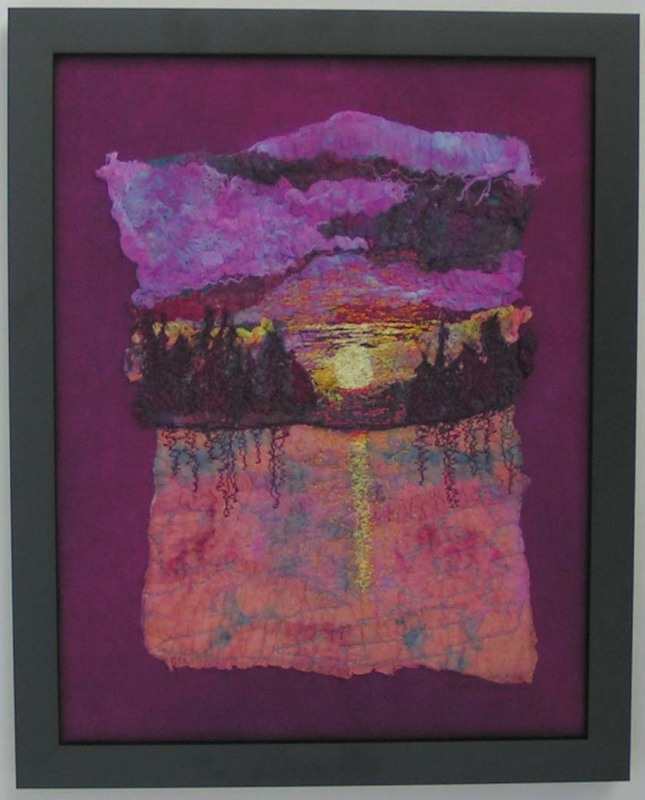 I particularly like the colour of the background to Flathead Sunset – delicious, it really enhances the mood of the subject. Thanks Tracey! choosing the background colors was fun and I like the end result of Flathead Sunset as well. Ruth they are lovely. I too particularly like Flathead sunset, whilst up the Northfork simply draws me right in and on. You’ve got the fabric background beautifully flat. It’s lovely seeing them finally complete. Good luck with the exhibition. Thanks Antje! The lacing process really does get the backgrounds nice and flat. Thanks judy! 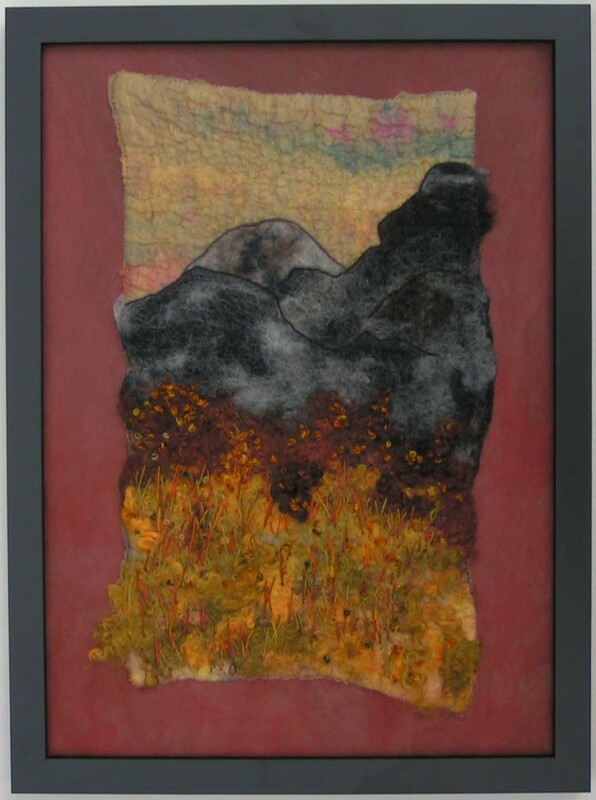 The backgrounds are all hand dyed cotton. 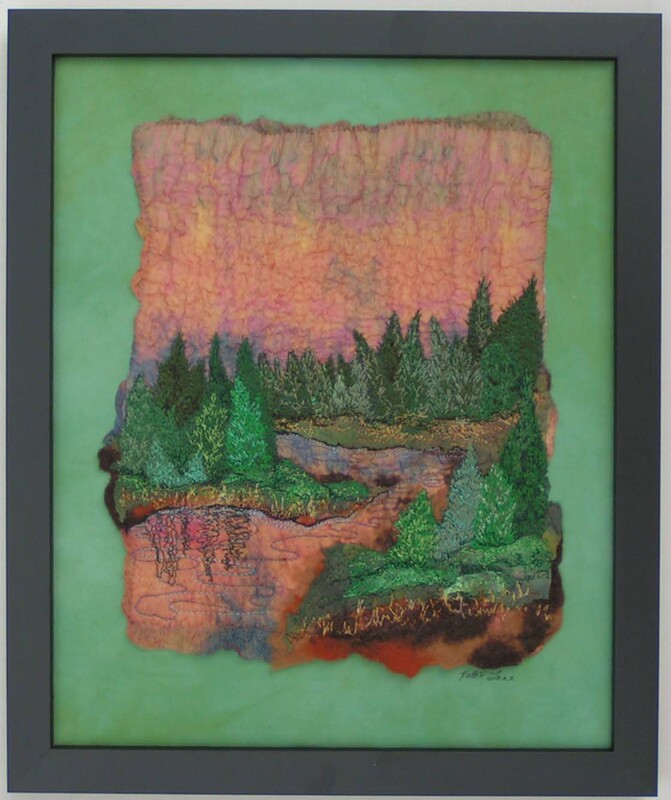 The only felt is in the landscape pieces themselves. Beautiful work, Ruth! I will try to make the show! Thanks Karen! You should definitely try to see the show. Paula will have work in the show you might want to see too! Thanks Tesi! Hopefully, others at the exhibition will think so too. Thanks Teri! Yes, the bee was buzzing around the flowers, it was funny. Thanks Marilyn, I am happy with the end result. They look fantastic, Ruth, and I’ve loved seeing them all develop and come together. They will make a fabulous group. Do post some pictures of the exhibition when the time comes. I’m trying to imagine them, roughly how big are they? Apologies, obviously not paying attention! They look great Ruth! I like them all but particularly Morning Aspen. Look forward to seeing photos of the exhibition. Thanks Karen! I will definitely post about the exhibition. They turned out great Ruth. Framing them really makes a difference. I am looking forward to seeing pictures of the exhibit too. Thanks Ann! Not too long now before the exhibition. They look great, Ruth 🙂 The backgrounds you’ve chosen work incredibly well, it almost looks like they are actual custom shaped mats/mounts on top of the pieces in some of the photos. Thanks Zed! I dyed the backgrounds and had to add paint to several because they weren’t dark enough.